Children are naturally impulsive and unable to understand the dangers of playing with guns and other firearms. Unfortunately, not everyone keeps their firearms safely out of the reach of children and adolescents. The result is that every year children and adolescents are seriously injured and even killed while playing with firearms. According to Safe Kids USA, in 2001, 72 children aged 14 and younger died from unintentional injuries related to firearm use. The following year, over 800 children of the same age range were treated in hospital emergency rooms for unintentional firearm-related injuries. Furthermore, non-powder gun-related injuries (including BB guns or pellet guns) resulted in approximately 8,300 children being treated in hospital emergency rooms in 2003. Most unintentional shooting deaths of children involve guns that are kept loaded and in a place that was accessible to children. They also occur most frequently when children are playing with the gun. Ninety percent of unintentional firearm-related child deaths occur in the home, with forty percent of those deaths occurring at the home of a friend or relative. Many children are too young to understand the difference between a toy gun and a real firearm and do not realize the seriousness of playing with a real gun. They should never have access to firearms. 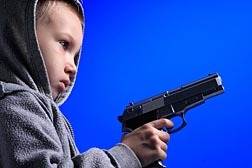 Many states have enacted child access prevention laws that may hold adults criminally responsible for not properly storing their firearms and allowing children access to such weapons. Sadly, not all adults properly store their firearms and the result is that children are seriously injured and even killed. Those who do survive their ordeals often face permanent disabilities, depending on the severity of their injuries. If your child has been harmed due to a firearm-related injury that resulted from someone’s failure to properly store their firearm, you may be eligible to file a lawsuit against the responsible party. Although no lawsuit can undo the damage that has been done, it can go a long way toward protecting other children from such injury. It can also help to recover the costs accrued by such an injury, including past and future medical expenses. When you need a lawyer who will exhaustively investigate a firearm-related injury and make sure that every responsible party is held accountable, contact The Killino Firm, where Keeping America Safe is our primary goal. To speak to one of our attorneys, please fill out the form on this page, call us toll free at 877-875-2927, or email one of our injury lawyers today. We will respond promptly to your inquiry so that you can experience The Killino Firm Difference.